How does a renowned Indian print journalism powerhouse adapt to the changing world of digital media? The short answer: it leverages a high performance network and web acceleration solutions to deliver news to global audiences at the breakneck speed at which news occurs – and at which audiences expect to hear about it. Which includes delivering heavy rich media images and video. Reliably. Because when you’re delivering over 40 million page views per month across more than a dozen publications, performance is key. The Indian Express Group (IEG) owns publications spanning every sector, but is mainly known for providing a true picture of India and the world at large. Recently, it’s been making headlines of its own with users and advertisers who appreciate a faster, more consistent experience. Sanjeev earned his MBA in Marketing from University of Ajmer, India. Before coming to The Indian Express Group, he held several senior sales positions, most recently at Monster.com. 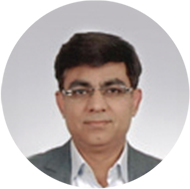 He has been the Business Head – Online with Indian Express Group since 2006. In this role, Sanjeev is responsible for managing the company’s web and mobile sites, and the Internet business of the Indian Express Group. He plays a lead role in online ad sales, technology and tech infrastructure, alliances, content, e-commerce, design & development as well as new product launches. One of his most recent achievements was a total, in-house revamp of the company’s web sites. The result: significant growth in both user base and revenue. The Indian Express Group has grown from a single print edition to 16 national editions and 4 language dailies that reach over 19 million people across the country. Its publications are associated with credible and fiercely independent journalism in India. The Group has adapted to the changing world with multiple publications that cover every sector with different styles. Indian Express Online is just one part of the Group’s evolution. Sanjeev’s challenge in tackling The Indian Express Group’s online business was to ensure that a publishing juggernaut could evolve to accommodate the changing digital world, where news is freely available from multiple sources online. That, in combination with the organization’s mission to arm India with the knowledge required to deal with an uncertain future and to champion freedom for the world at large, was no small task. IEG’s multiple websites, which throw light on a range of topics covering Indian politics, economy, business society and culture, include: The Indian Express, The Sunday Express, The Financial Express, Loksatta, Jansata, Lokprabha and Screen. When Sanjeev joined The Indian Express Group, the publisher’s reach and user base was less than 10% of what it has grown to today. Its flagship publication, Indian Express, was relying on a single location data center delivery services. Content was refreshed daily and hourly for what was then the real-time news portal expressindia.com. Sanjeev moved the hosting to the cloud which overcame performance issues however scalability and security issues affected availability of IEG sites. Sanjeev found, however, that IEG was experiencing performance issues because all content was served out of one location: Singapore. Scalability and availability issues when reporting breaking news events caused websites to be slow and unresponsive. Sanjeev’s team spent a great deal of time dealing with technical issues related to website downtime and security threats. Such performance, availability and scalability issues were unacceptable to a brand with a reputation as the leading journalistic voice of India. IEG needed the ability to deliver to India (where 60% of its viewership traffic resides) and to the rest of the world. The media company sought a solution that could handle traffic peaks during predictable events like elections or sports, and unexpected traffic from late breaking news. IEG’s solution had to offer the performance it expected at the right price point, and provide great ongoing account management. Sales interaction and a strong account management team were the fourth parameter in Sanjeev’s search for the best delivery partner.